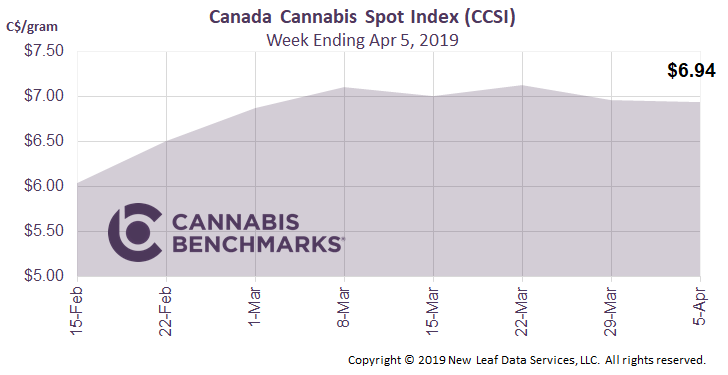 The CCSI moved higher by 2.5% to C$7.11 per gram, from last week’s C$6.94 per gram. This week’s price equates to US$2,418 per pound at current exchange rates. The hype around cannabis legalization and the tax revenues that would pour into federal and provincial coffers seems to be slowly fading. Several provinces are restating their future revenue projections from this highly publicized new source of tax revenue. The Ontario budget, released on Thursday, gave some new insight into the current state of the legal cannabis market in the province. Ontario, with 38% of the country’s population and an estimated 1.8 million cannabis users, cut their projected revenue from cannabis excise taxes to C$80 million from C$115 million for the 2019-2020 fiscal year. The cut reflects a black market still thriving due to volatile supply, limited retail locations, and higher than expected prices at the counter in the legal market. In reaction to the revised budget, Ontario politicians are engaging more deeply with Premier Doug Ford’s government and introducing changes to how cannabis is sold across the province to increase sales in the legal market. The U.S. is closely monitoring the evolution of these markets in Canada and the Canadian case study could play a formative role in how some states move forward. 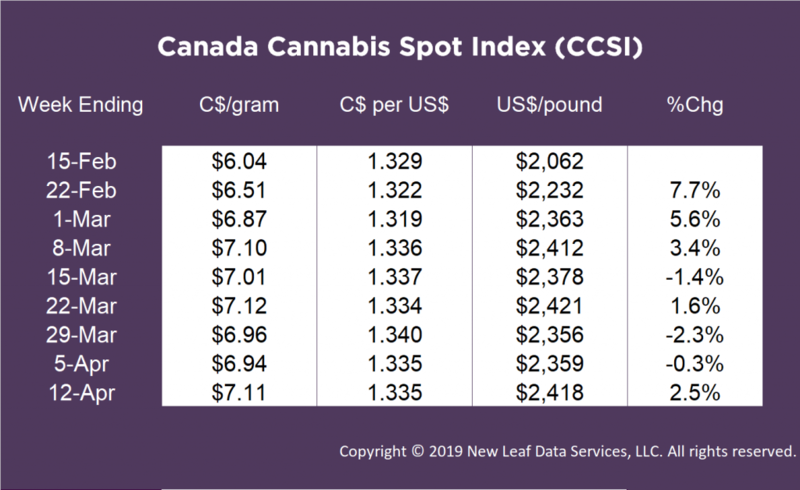 U.S. Cannabis Spot Index up 0.3% to $1,068 per pound. The simple average (non-volume weighted) price increased $53 to $1,161 per pound, with 68% of transactions (one standard deviation) in the $389 to $1,932 per pound range. The average reported deal size increased to 2.9 pounds from 2.7 pounds last week. In grams, the Spot price was $2.36 and the simple average price was $2.56. The relative frequency of trades for indoor flower increased week-over-week by 4%. The relative frequency of transactions involving greenhouse and outdoor product decreased by 1% and 3%, respectively. Greenhouse product’s share of the total reported weight moved nationwide contracted by 2% relative to last week. The relative volumes of warehouse and outdoor flower both increased by 1% each. National relative volumes one year ago at this time were observed at 53%, 29%, and 18%, for indoor, greenhouse, and outdoor product, respectively. The U.S. Spot Index ticked upward marginally this week, by $2, to settle at $1,068 per pound, recovering slightly from last week’s current annual low. Relative steadiness in the Spot Indices of California and Washington helped to offset declines in Colorado and Oregon, while rising rates in Nevada, Michigan, New Mexico, and Alaska, among others, ultimately pushed the national composite price up a bit. 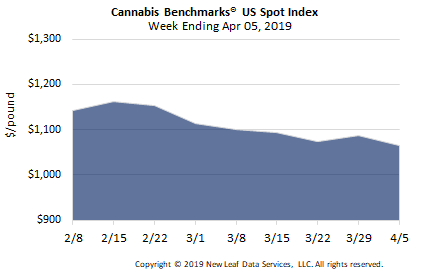 Last year at this time – a week ahead of 4/20 – the U.S. Spot Index slipped by 1.4%, from $1,386 to $1,367 per pound, although it must be noted that it had previously trended upward from mid-February through early April. This week’s national composite price is off by 22% year-over-year, maintaining the overall rate of decline observed in annual average prices from 2017 to 2018, which was 23%. 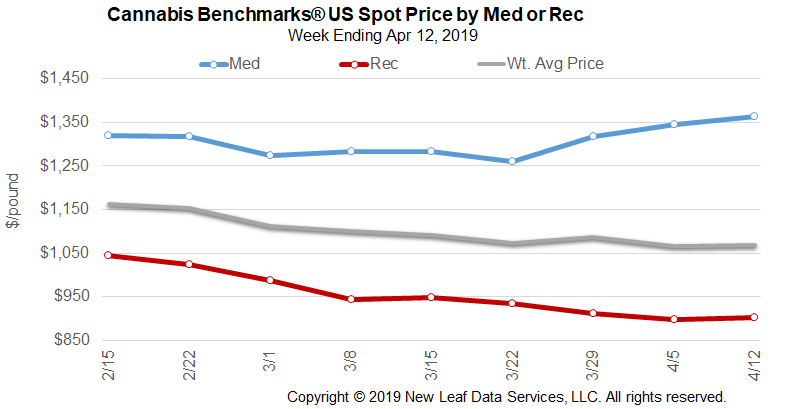 The national volume-weighted price for flower to be sold in adult-use markets rose slightly this week on significant increases in the Spot Indices of Nevada and Alaska, as well as a modest uptick in Washington’s composite price. Rising prices for medical product in Illinois, Michigan, and New Mexico, as well as a couple other smaller markets, were primarily responsible for pushing up the national rate for flower to be sold to patients. May 2019 Forward unchanged at $1,050 per pound. The average reported forward deal size declined to 44 pounds. The proportion of forward deals for outdoor, greenhouse, and indoor-grown flower was 60%, 28%, and 12% of forward arrangements, respectively. The average forward deal size for monthly delivery for outdoor, greenhouse, and indoor-grown flower was 41 pounds, 49 pounds, and 44 pounds, respectively. At $1,050 per pound, the May Forward represents a discount of 1.7% relative to the current U.S. Spot Price of $1,068 per pound. The premium or discount for each Forward price, relative to the U.S. Spot Index, is illustrated in the table below. 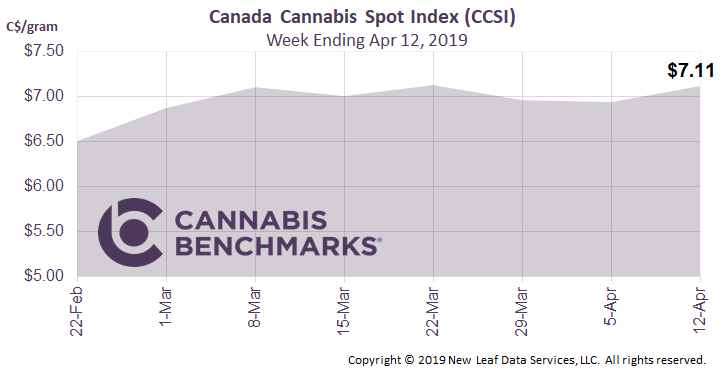 The CCSI remained essentially flat this week at C$6.94 per gram, when compared to last week’s C$6.96 per gram. The price range has been relatively steady over the past six weeks, with only a $C0.18 difference between the low and high extremes observed in that span. This week’s price of C$6.94 per gram equates to US$2,359 per pound at current exchange rates. According to Statistics Canada, 15.4% of the Canadian population above the age of 15 reported using cannabis, which works out to approximately 4.63 million people across Canada. Also from the Government of Canada, we are able to access nationwide retail sales figures. From the latest published data, we can see that C$53.38M in revenue was generated in the month of January. January’s sales are down by C$2.5M, or 4.5%, from those of December 2018. When we merged the January sales data with the reported number of users, we are able to estimate the average spend per person. These calculations tell a very interesting story about the usage in each province, and have implications for the development of the legal market across the country. British Columbia, known colloquially to be the cannabis capital of Canada, has a uniquely low spend per person. This implies that the lack of product inventory or higher prices at legal retail outlets have resulted in much of the population turning to the illicit market for their supply. Ontario, the largest province with almost 38% of the Canadian population, has sales figures lower than Quebec and Alberta. The reason cannabis users have been spending less on legal cannabis could be due to the exclusively online sales format that prevailed until April 1st of this year. With the recent opening of 10 brick-and-mortar locations in Ontario and 15 more by the end of this month, we expect sales figures and spend per person to increase significantly. Manitoba, Newfoundland & Labrador, Alberta, and New Brunswick each has a calculated spend of approximately C$25/person during January. Based on our price index, this equates to approximately 2.5 grams of usage per month. 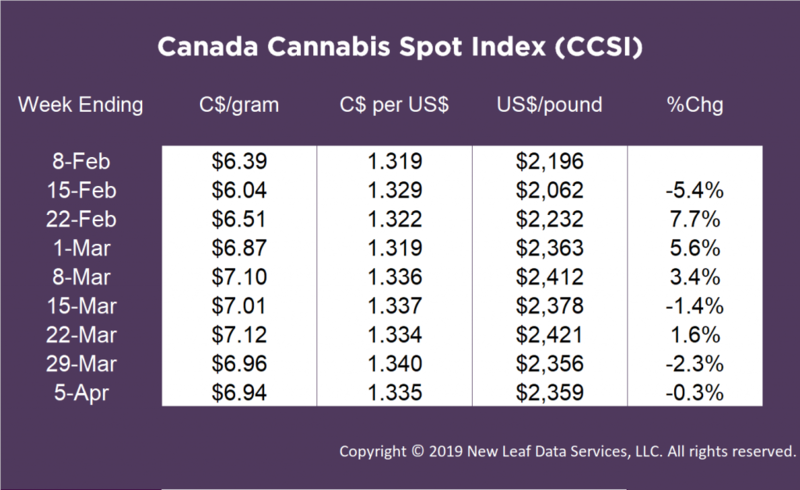 U.S. Cannabis Spot Index down 2.0% to $1,066 per pound. The simple average (non-volume weighted) price decreased nearly $10 to $1,108 per pound, with 68% of transactions (one standard deviation) in the $369 to $1,846 per pound range. The average reported deal size was nominally unchanged at 2.7 pounds. In grams, the Spot price was $2.35 and the simple average price was $2.44. The relative frequency of trades for indoor flower decreased week-over-week by 1%. The relative frequency of transactions involving outdoor product increased by the same proportion, while that for deals involving greenhouse flower was flat. Greenhouse product’s share of the total reported weight moved nationwide increased by 3% relative to last week. 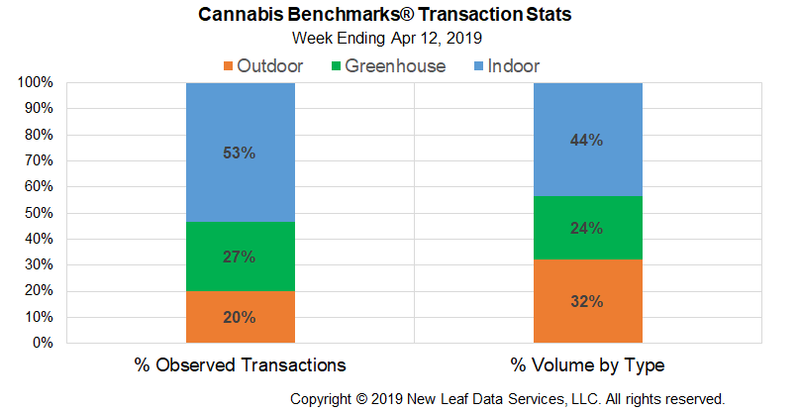 The relative volumes of warehouse and outdoor flower both contracted, by 2% and 1%, respectively. 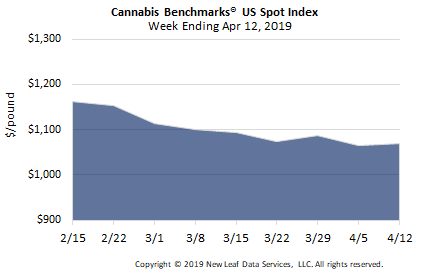 The U.S. Spot Index declined by 2% this week, resuming the downward trend that commenced in mid-February and sliding to a year-to-date low of $1,066 per pound. The five largest adult-use markets – California, Colorado, Oregon, Washington, and Nevada – all saw their composite prices decrease this week. 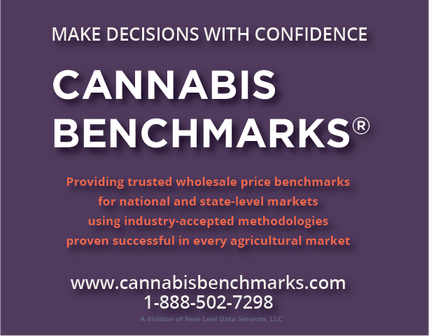 Notably, reported wholesale rates in California remain relatively stable, despite some market observers sounding the alarm regarding the expiration of temporary cultivation licenses, a matter we discuss below in more detail. This week also saw several markets that have seen rising prices for much of this year experience declines, namely Illinois, Rhode Island, and Washington, D.C. With just two weeks to go ahead of 4/20, it appears that the holiday will not result in discernible upward movement in the national composite rate, as it has in previous years. 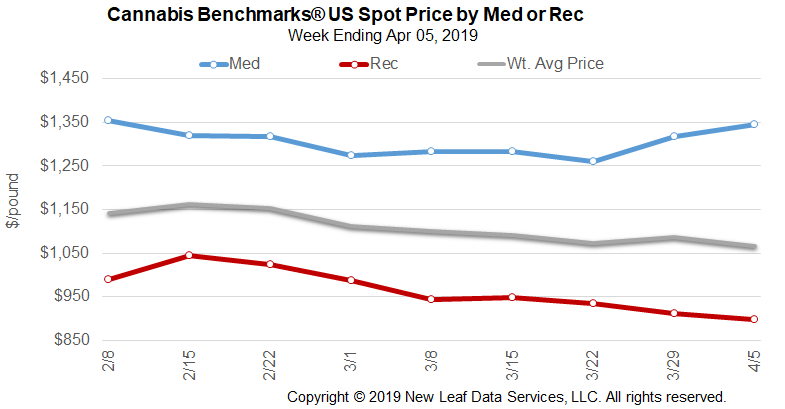 The national volume-weighted price for flower to be sold in adult-use markets declined this week on decreases in all four of the major Western markets, as well as Nevada and Alaska. Rising prices for medical product in Maine, Michigan, and Massachusetts were primarily responsible for pushing up the national rate for flower to be sold to patients. October 2019 Forward initially assessed at $975 per pound. The average reported forward deal size declined to 45 pounds. The proportion of forward deals for outdoor, greenhouse, and indoor-grown flower was 59%, 29%, and 12% of forward arrangements, respectively. The average forward deal size for monthly delivery for outdoor, greenhouse, and indoor-grown flower was 42 pounds, 49 pounds, and 44 pounds, respectively. 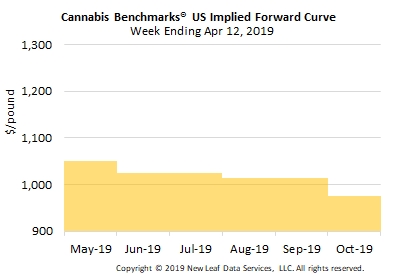 The October 2019 Forward was assessed at $975 per pound, 3.9% lower than the September Forward of $1,015 per pound. For context, the U.S. Spot Index averaged $1,117 in September 2018 and declined 3.7% to $1,076 in October 2018. At $1,050 per pound, the May Forward represents a discount of 1.5% relative to the current U.S. Spot Price of $1,066 per pound. The premium or discount for each Forward price, relative to the U.S. Spot Index, is illustrated in the table below.